Suitable for family holiday, friendly families, groups of pensioners, students and groups of workers. Enjoy every one who wants to relax actively and passively. Story building in the valley at the weir Moravian Thaya, surrounded by meadows and surrounding forests, offering comfortable accommodation for up to 16 people. You will spend a pleasant holiday in peace. The surrounding beautiful countryside so. Czech Canada offers unspoiled nature. During the day trips around (Dačice, Telč, Slavonice, Jemnice, Landstejn, Roštejn, J. Hradec, N. Bystřice, Trebon, and others. ). Active use of time in and relaxation associated with bathing. Hiking and biking trails. Swimming is possible at the building the pool AZURO 7.3 x 3.7m with a depth of 1.2 meters, heated by a heat pump with operation from May to October. Bathing in the river Thaya. Free high speed Internet access throughout the building and outside. 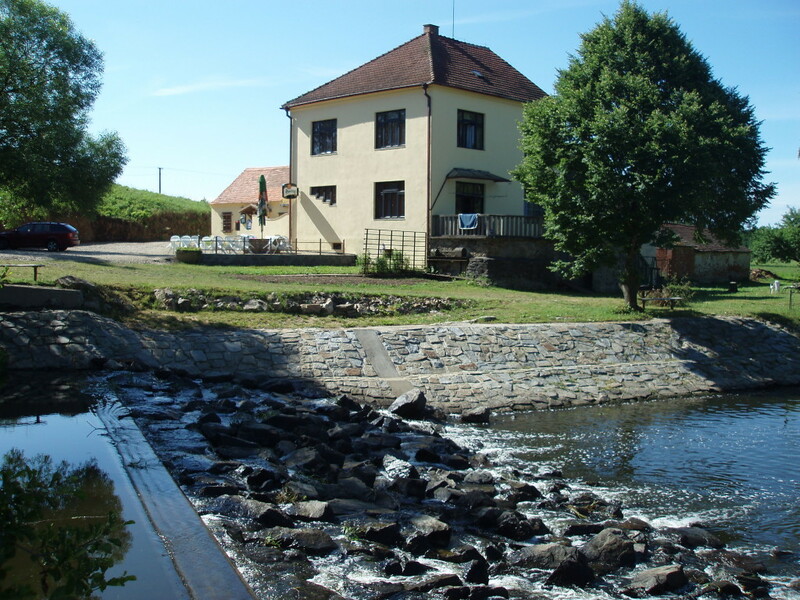 The first mention of the mill at the River Thaya date from 1369 and are also the first mention of the existence of the village. Ideal for 2-4 friendly families or small groups of friends or work groups (meetings, seminars, team building events, celebrations …). Near the mill there are sports where you can play football, tennis, volleyball and other sports. Part of this sport is also a playground with swings, slide and sandbox. This area is located approximately 500 meters from the mill. YEAR-ROUND OPERATION – central heating. GROUND FLOOR IS A WHOLE DISABLED! Heating: Automatic – central heating. Transport, parking: Drive directly to the building – free parking. Dačice bus to stop, even in Vnorovice (600 m). Train to Dačice or Urbanec (2 km – walk). Large lounge with access to the covered terrace (beautiful view of the meadow, river and weir), fully equipped kitchen – stove with oven, microwave, kettle, fridge freezer, dishwasher, washing machine, high speed Internet + FREE WIFI. Fireplace, barbecue, sun loungers by the pool AZURO – 7.3 × 3.7 m, depth 1.2 m, a heated heat pump to operate from May to October, jumping 4.5 m trampoline, table tennis, table football for 4 persons fireplace with facilities. Other sports facilities nearby – tennis, football, volleyball.